This charming jewelry set sparkles with vintage-style elegance. 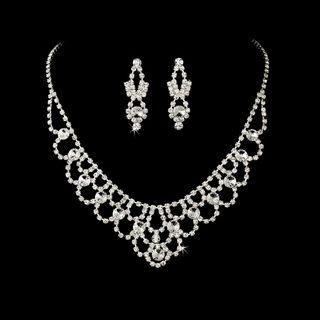 Featuring an array of glittering clear princess and round-cut rhinestones, this necklace and earrings set will make you feel radiant on your special day. This would be a beautiful accessory for weddings, proms, homecomings, or any formal affair! Size: The necklace measures 16" long with a 3" adjustable extender. The matching earrings measure 1-1/2" long.